APPEARANCE: Bake ichō no sei are the spirits of ginkgo trees. They are very tall, with bright yellow bodies the color of ginkgo leaves in autumn. They wear tattered old black kimono and carry small gongs. BEHAVIOR: Bake ichō no sei appear near very old ginkgo trees and strike their mallets. It’s not known whether there is some purpose to this other than making those who hear them feel strange or shocked. 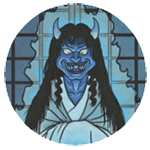 ORIGIN: Bake ichō no sei was first depicted in an 18th century yōkai scroll by Yosa Buson. Although he described as the ghost of an old ginkgo tree from Kamakura, he did not include a detailed description of it. 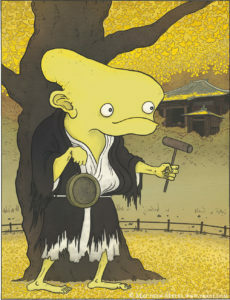 Later, Mizuki Shigeru elaborated on this spirit and connected it to old superstitions about ginkgo trees. While ginkgo trees are beloved for their beauty, resistance to fire, and wind breaking abilities, folk beliefs also hold them as inauspicious to have in a home garden for a number of reasons. They are high ranking and holy trees, so they belong in the gardens of temples, shrines, and public places; not private gardens. Planting a ginkgo is one’s own garden was sacrilegious. In addition, they grow tall very quickly and can cause a house to become dark, which can interrupt or alter the flow of in’yō (yin and yang) energy. If the roots grow underneath the house, they could spread sickness and misfortune to a family for many generations. Residents in houses with ginkgo trees would become sick and die much sooner than those without. All manner of strange things could happen in and around houses which had ginkgo trees in their gardens.